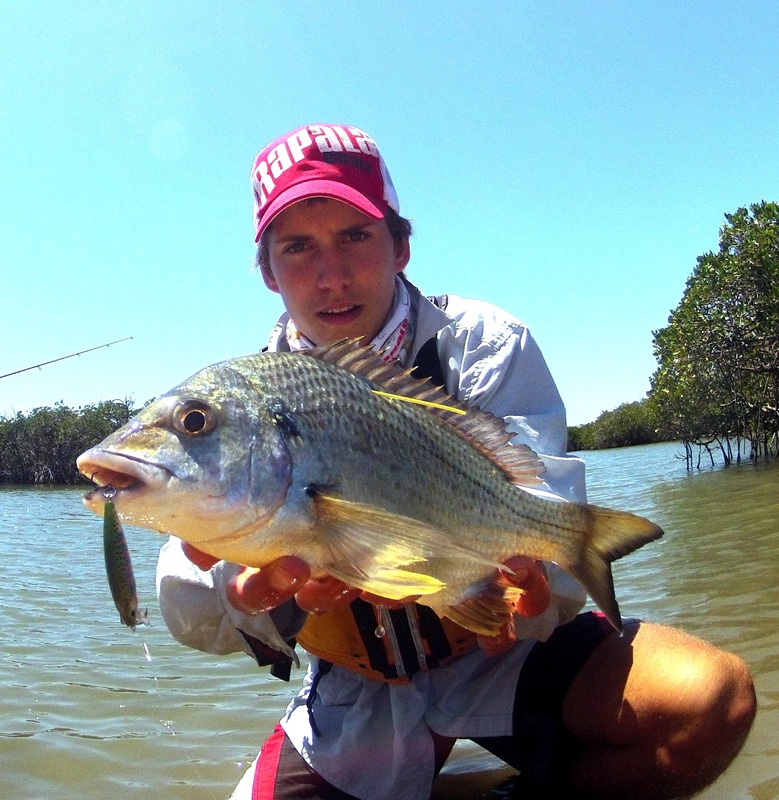 Regular guest contributor Rhett Thorne from Mad Keen Yak Angling looks at the X-Rap Countdown! Over my last few yak fishing trips, in the local estuary systems, I have had an increasing success with slow sinking hardbody lures. These lures, namely the Rapala Countdowns, Mini Fat Raps and the Rapala Ultra Light lures excel when targeting a variety of species with a more finesse approach. While floating lures are the most conventional technique for fishing the structure, sinking lures bring a new dimension to the game of snag bashing. The Rapala X-Rap Countdown is a new addition to the Rapala range, being introduced for the end of 2012. By incorporating a negative buoyancy into the aesthetic finish of the Rapala X-Rap, this new little lure swims with a seductive body roll, but then on the pause, falls with an attractive flutter to entice hungry fish into a bite. With the added weight the Rapala XRCD casts like a bullet making it an accurate casting lure, even in windy conditions. The day after the Rapala X-Rap Countdown hit the shelves I was testing these lures out from the kayak. 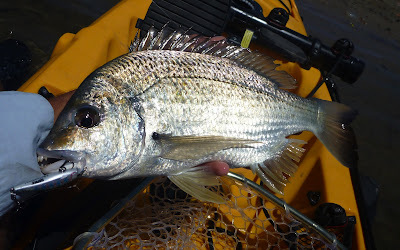 In about 3 minutes after launching the kayak I had already hooked up on a nice yellowfin bream by just trolling and twitching the lure over the flats. With a quick change of tactics I began casting the lure deep into the mangrove overhanging banks now I was further away from the boat ramp. Once the lure lands in the snags, it pays to take it slow and give it a few sharp twitches then give it a pause, so that the lure flutters down to the bottom and imitates an injured fish. Bream arn't the only predators in these waters. 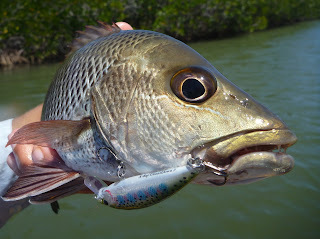 This mangrove jack smashed the lure as soon as it hit the water. After only one day of testing out this lure I had landed 2 yellowfin bream, 2 black/pikey bream, 2 mangrove jacks and even a couple little moses perch. This little lure has really impressed me and I can’t wait to see what fish it will pull out of the snags next time. A solid yellowfin bream tagged and ready for release. Words and Pics: Rhett Thorne - reproduced with permission. Read more from Rhett's at Mad Keen Yak Angling.